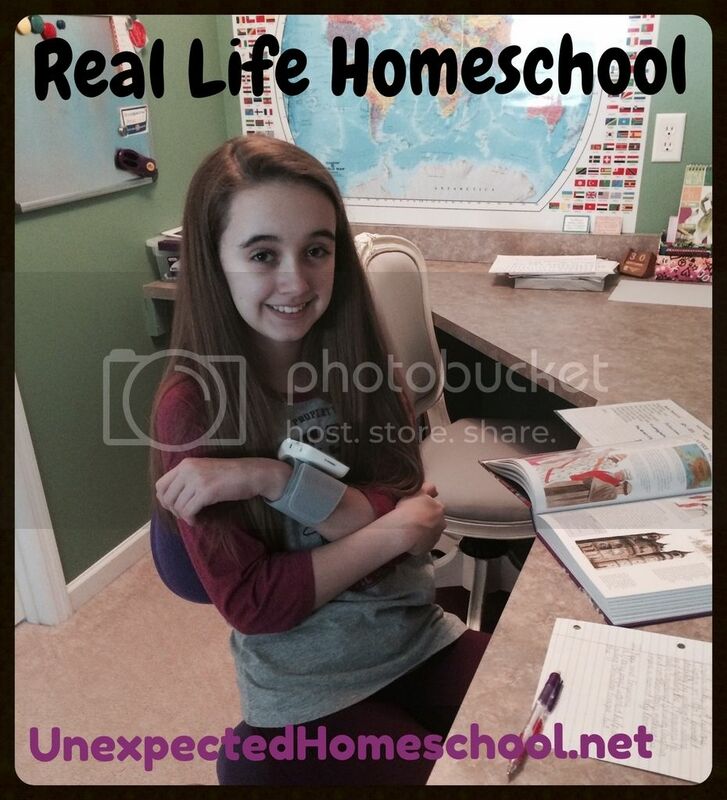 This week I'm participating in the TOS Review Crew's 5 Days of Real Life Homeschool blog hop! So hang on for a glimpse into what actually goes on around our house (not not just what I sum up weekly). Our real life homeschool probably resembles many others: we have good days, perfect days, okay days, and the really horrid days. We've almost entirely given up on a weekly schedule due to Amber's frequent appointments and dysautonomia flares. We do have a rhythm to our days that we like to keep going, but a set schedule is long gone. The week I tracked is from back in March. It was more hectic than an ideal week with co-op classes, doctors' appointments, and social events which meant little less school happened that particular week than I'd like, but that's real life. The day didn't have a great chance of success considering we were out late (for Amber) the night before attending a live performance of Phantom of the Opera. 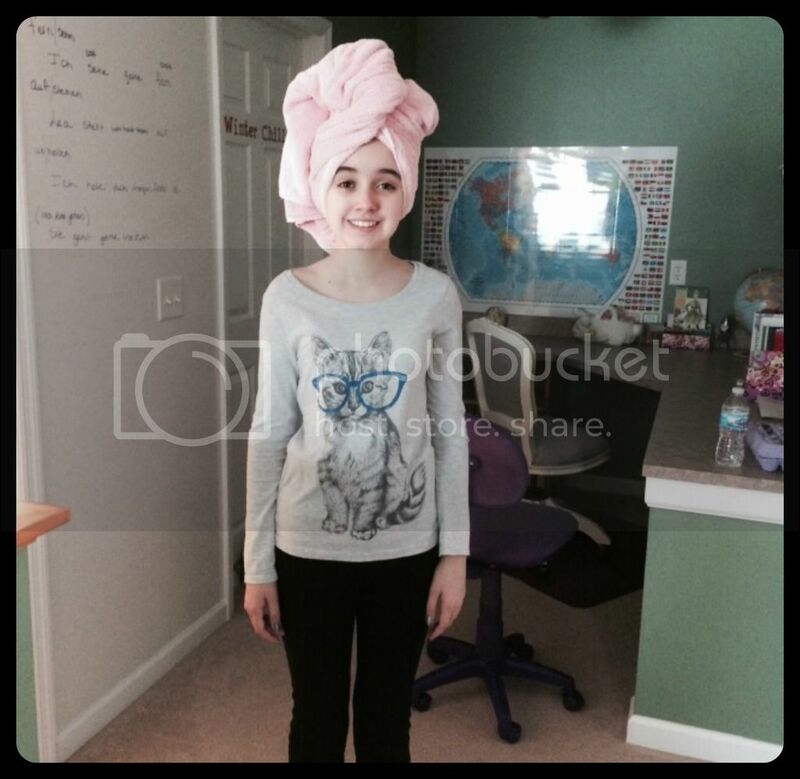 While it was a wonderful experience for Amber, her body was not handling well all the physical needs of that event. I wake up at my normal time which is roughly 8:30 am. I'm not an early morning person and don't plan on trying to become one. I shower, check my email, link up one of my blog reviews that had gone live, check other internet stuff, eat my GF breakfast bar, and do quiet jobs around the house so not to wake my exhausted child. I try three separate times to see if Amber was ready to wake before she became hungry enough that she had to finally stay awake. At 11:00 am Amber decides she really can sit up in her bed without feeling sick. I bring her morning medication along with her breakfast to her bed, which is our normal procedure. We have been instructed by Amber's neurologist to keep her in bed until her morning medication has time to be effective, which includes breakfast time. If she gets up too soon, her blood pressure plummets and she loses consciousness. Now that Amber is awake I can finally start some laundry while she eats and reads on her iPad for a few minutes. Normally she would start some school work in her bed, but she's up so late this morning that she will shower as soon as it's possible. By 11:30am Amber feels she can successfully shower. This will take forever, as usual. The combination of the heat and arm movements to wash her long hair cause problems with her blood pressure and heart rate. Even with a bath seat to keep her from standing, she will have severe tachycardia when she gets out. Amber does shower daily though, so it's something that we have to allot for in our schedule. During her showers I hang around her portion of the upstairs to listen for any problems. Since my desk is in the open loft room that is a perfect place for me to wait. I pay bills, tidy my desk, make a shopping list for Target in case Amber has energy for that, and play with the cats (we have three). It's now 12:30 pm and Amber is ready for her after-shower rest and checkup. Her heart rate is running about 165, which is actually fantastic for her after a shower. However, she is very confused and can't string sentences together. This means she's having circulation problems and will probably have brain fog all day. We expected a crash of this nature and it looks like we were right. Amber is now ready for me to help her with her hair too. Again raising her arms, even while sitting, causes problems especially so soon after the shower. She decides to have me just style a wet pony tail to save everyone effort, and since the weather is getting warmer I allow it. 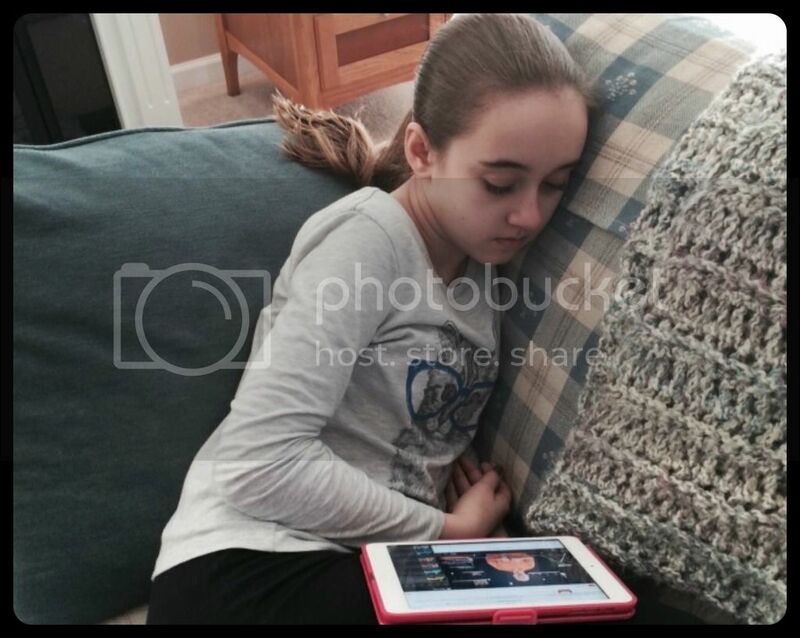 While normal people would have lunch at this point (1:00pm), Amber had breakfast just two hours earlier and is experiencing nausea. She has extremely slow motility (from the dysautonomia) so some days she can eat and others she can't. We grab a quick snack and head to the allergist's office, which is only 3 minutes from our house, for Amber's weekly allergy shot e.
Amber took her Greek Morphemes to the allergist since we have to wait for a half hour after the shot before leaving. The wait is required to watch for adverse reactions to the shot. I am amazed that Amber has the brain power to work on the Morphemes. This particular week there is an elderly man patiently waiting for his wife in the usually empty waiting room. He wants to talk about everything and nothing, so I chatted with him for the half hour. Now 1:45pm and Amber believes she can handle a quick run to Target and Petco (they are next door to each other). Red Robin is also in the same strip mall, so we pick up a to-go order of allergy fries for Amber. Unfortunately, Amber was wrong about her stamina and can't make it into the house from the car. She's also still nauseated and isn't interested in her favorite fries. 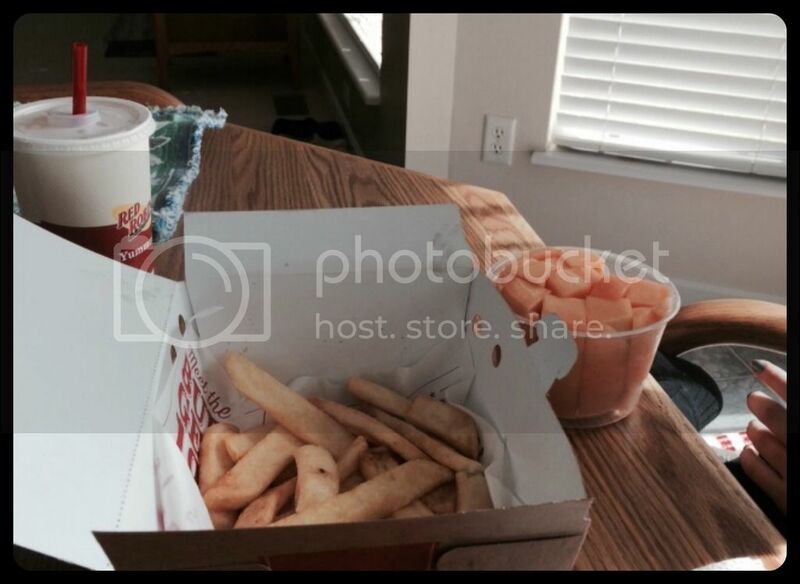 Eventually in the house I convince her to eat some fries and cantaloupe with a ton of water. It's 3:15 and Amber decides she will just lay down on the couch and rest. She has her trusty iPad with her and decides to watch a couple Crash Course Astronomy episodes. We didn't find out about them until the eighth episode was already out. I work on more laundry, feed the cats wet food, put away the stuff from Target, and plan for the neurologist appointment on Tuesday. I need to vacuum but it's too loud for Amber right now. While I'm working on questions for the neurologist (about 4:15), Amber comes upstairs to take out her contacts. She NEVER takes them out before bedtime. She says she can't keep going and is going to take a nap. I can't remember her last actual nap, so of course I'm more concerned than normal and watch her carefully. This also means I can keep working on laundry, but I need all my other tasks to be quiet. I try to plan some dinners, but I don't make great progress. Around 5:45 Amber wakes again and immediately puts back in her contacts. She decides that she can handle practicing her flute and goes down to work on that for a while. I hang out downstairs while she is practicing and decide we are having mac and cheese for dinner. Amber and I have to eat gluten free but the box mixes all contain items which Amber reacts to as well. So, even mac and cheese is something I have to make from scratch. Thankfully, I've got homemade macaroni frozen in the freezer. Crash Course while she's crashing. It's 6:30 pm and Fred is home for dinner, but Amber still isn't interested in food and says her tummy is unhappy. She plays with her dinner and drinks more water. Then shes goes in to watch TV (Disney Channel) and iMessage her best friend on her iPad. I continue to work on laundry, clean up the kitchen, finalize questions and data for the neurologist, and watch tv with Amber for a couple of minutes. Then I remember Amber's photography art assignment for her co-op class needs to be emailed to the teacher. I also decide I should maybe start planning at least one of the two co-op classes I teach. At 9:30 Amber is sent upstairs to get ready for bed. I put away the laundry from the day and make sure Amber is doing ok. She should have showered because of the neurology appointment the next morning, but she can't physically handle it. Tomorrow will be difficult. Amber is finally in bed at 10:15 pm and I lay down and do some internet stuff for a while before I'm tired enough for sleep. Whew. End of the day. I was actually pleased to see Amber accomplish a little bit of school considering how sick her body was from the activity the day before. While she didn't accomplish even half of what she should on a good day, she did make progress. Come back tomorrow to see how Tuesday shaped up for us! Thanks for sharing your day with Amber. It is really hard to explain how days are with a high end special needs child. I think you did a great job. What a trooper your child is! I had never heard of dysautonomia before! The way you describe her symptoms - they sound just like my first trimester pregenancy symptoms! I'm amazed she accomplished so much - feeling that way! There never seems to be a normal day when homeschooling. Thanks for sharing your day! Prayers for your beautiful daughter.